"Bruno would be teaching them to make a pâté de foie gras and also how to get five separate meals from a single duck. The baron would be showing them how to make a stuffed neck of goose and then use it in a classic Périgord cassoulet. Ivan from the bistro was giving up his day off— for a fee— to demonstrate how his desserts were made— crème brûlée, tarte aux noix, pears poached in spiced red wine, sabayon aux fraises. This last, a dish of strawberries in a creamy custard, was a favorite of Bruno’s. Odette from Oudinots’ farm was taking them to find various kinds of mushrooms in the woods and then showing how best to cook them with veal. Stéphane was to demonstrate how he made his cheeses and yogurts. Julien was giving them a tour of the town vineyard and winery, and Hubert was giving them a wine-tasting session. Along with a tour of Bergerac vineyards and a couple of sightseeing trips to the Lascaux Cave and some châteaux, they were in for a busy week, Bruno thought. Pamela and her English friend Miranda had planned it well." (Kindle Locations 258-265). Of course the cooking, eating, and teaching are all interrupted by Bruno's need to solve a particularly ugly and violent murder that happens at the beginning of the book. One of the victims, in fact, is a missing student from Pamela's cooking school. 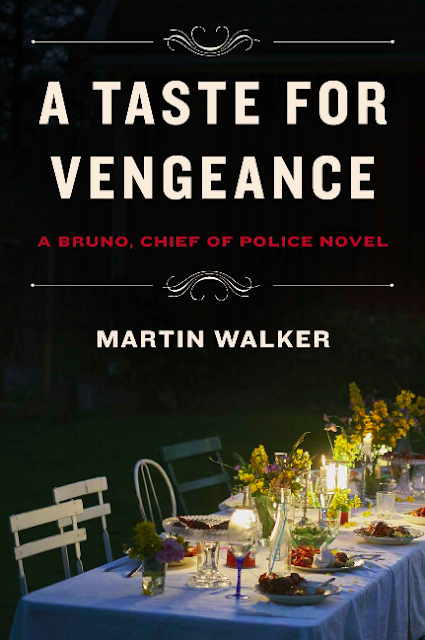 International intrigue, exciting confrontations with criminals, and constantly increasing suspense all serve as a background to the remarkable food descriptions that are clearly the main attraction in this enjoyable book. I have read one of these novels when it was selected for CTB. I wanted to get into the series but my pile of books is so tall I don't know when I will be able to add to it. @Sherry -- books about French food can be annoying when they are written by snobs, but many of them are quite enjoyable. If you are forced to listen to an annoying snob, I can see how you would feel about it, though. Mae, I've enjoyed all the books in this series, and now looking forward to getting this one.